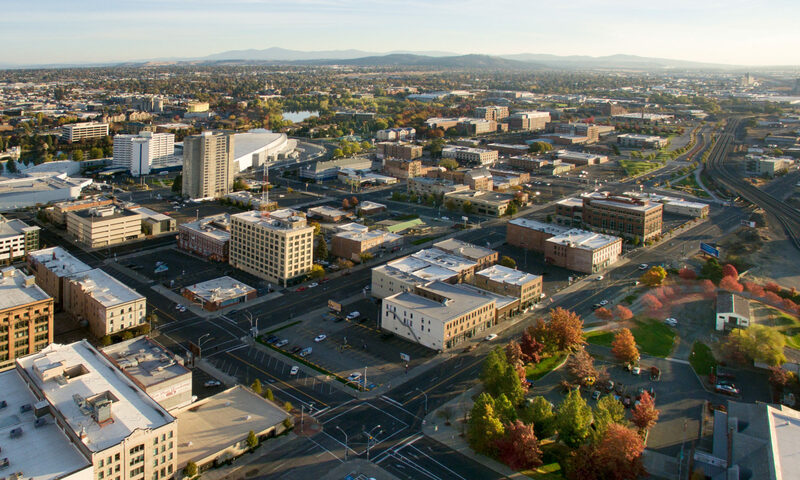 Since the earliest days of human settlement in the inland Northwest, the region has marked a critical juncture between conflicting forces. In a dramatic fashion, it is here that the dry, barren desert of the Great Basin comes together with the ponderosa pines and snowcapped peaks of the Selkirks. It was here that some of the earliest settlers of the Oregon Territory clashed with the Native peoples who had called this region home for hundreds and hundreds of years. It was here that David Thompson established the first long-term European settlement in what would become Washington state, noting the critical crossroads at which the area lies. It was here that one of the most important railroad centers in the entire western United States decided with Expo ’74 that it wanted something new, something fresh, something better. Indeed, the history of the inland Northwest is positively littered with critical transitions, crossroads, changes, conflicts. They’ve challenged us, renewed us, torn us down, and built us up. They’ve made us what we are. Well, today, Spokane lies at one such critical crossroads in its history. KXLY land grab at South Complex? This draft/conceptual site plan for the KXLY site at Regal and Palouse Highway on Spokane’s South Hill was presented by KXLY representatives at a Land Committee meeting of the Parks Board. Note the plan to build a large mixed-use facility on land currently owned by the Parks Department and relocate the soccer fields to the rear of a new big-box store. Please note that this document is in the public record. Following up on a tweet from last week, The #spokanerising Project can now report that KXLY representatives are in discussions with the Parks Board for a land swap that could result in a significant change in the recreation and parks facilities offered in the Southgate District, as well as the second of three major big-box developments that have been planned for the area. Please note: these plans have not been submitted to the Planning and Development Office. They represent conceptual drawings for the site that were presented by KXLY at a Land Committee meeting of the Spokane Parks Board in December of 2013. That meeting resulted in a Letter of Intent, specifying broadly that the Parks Department would enter into an agreement with KXLY to swap land in order to ensure shared access and potentially shared parking. Essentially, the City would agree to swap a piece of land in order to create a shared driveway where the current South Complex parking lot is located, and potentially including the entire east end of the complex, if KXLY chooses to build a mixed-use building. In exchange, KXLY would grant to the Parks Department replacement soccer fields on the west side of their proposed big-box development, near and underneath their AM radio transmitter tower on the site. The #spokanerising Project opposes plans to increase coal shipments through the inland Northwest. Such shipments, estimated at 18 additional trains daily to supply the Gateway Pacific Terminal alone, would harm our neighborhoods and threaten our neighborhood vitality. Collectively, the coal conglomerates want to ship an additional 150 million tons of coal every year to China and other developing Asian nations. That’s enough to fill 10,000 more trains every year, and most of them would roll through Spokane’s neighborhoods and its downtown. Spokane should be the epicenter of this debate. As the largest inland city on the route from the Powder River Basin to the coast, we stand to lose the most from the export proposals. Think about the impact of 18+ additional trains at Witter Aquatics Center, located across the street from Avista Utilities at Perry and Mission. Think about the impact of 18+ additional trains on the burgeoning University District, set to be a full-scale medical and graduate school. Think about the impact of 18+ additional trains downtown, where Expo 74 promised to clean up a dirty, seedy central business district–and then delivered. Who’s going to want to develop in neighborhoods like that? Who’s going to want to increase neighborhood vitality in a neighborhood where trains diminish property values and destroy quality of life? Coal trains are antithetical to increased positive development. We learned a lot from Expo, but if these coal export proposals are developed, then we risk going back on the commitments and the changes that we made. We risk going back to before 1974. And that’s not a risk that we should be taking. Last Friday, Spokane Public Market announced that it would close its doors by this coming Friday, March 7. The Market opened at 2nd and Browne in 2011 to great expectations, but tepid customer support. The year-round food and artisanal-item market was designed as a centrally-locating gathering place that would be quickly expanded and remodeled into a more attractive space. These plans didn’t pan out, and within a year, it was controversially begging for support on its Facebook account, on posts that have since been deleted. We can’t help but lament the loss of the Spokane Public Market as a civic resource, but we also question the back story behind the move toward its closure. The market has been languishing for years, with no major changes in order to attract more customers and vendors. With nearly 5,000 Facebook likes and a strong base of vocal support, we question whether everything that could have been done to save the market was done. Regardless, Spokane Public Market will close March 7. Perhaps the space should be reopened as a combination public market-events center-fast casual food court a la San Jose’s San Pedro Square Market? What are your thoughts on the Spokane Public Market closure? Share your comments below, engage with us on social media, and contribute a post in response. We want to hear from you. We wrote a couple weeks ago that building an expansive fiber-optic network should be one of City Hall’s top priorities. With the recent announcement that Google Fiber is expanding to new cities, we have a clearer picture of how Spokane might be able to get in on the action. Most importantly, Google describes its planning process for Fiber as one with two parts. First, cities complete what the company calls a “fiber-ready” checklist. Then a detailed city study begins. Spokane can get a head start on other cities that will inevitably be competing for fiber in the future by completing a checklist now. Spokane can procure the necessary maps of existing utility poles, gas, power, and water lines. It can provide a clearer picture of the existing fiber services and dark fiber that are lying dormant underneath the city. It can streamline the permitting and approvals process for fiber-optic lines regardless of whether or not Google comes knocking sometime down the road. These moves would be beneficial for any potential actor to get in on the fiber action. It doesn’t have to be Google. In fact, numerous companies operate fiber optic networks within the city already, albeit on a primarily commercial customer basis. By making this information more readily available and making it easier to get a permit for work on internet infrastructure, Spokane could jumpstart a potential fiber expansion. What are your thoughts? Can the dark fiber be lit? Would Spokane be better served by a municipal internet utility that works like its existing water and garbage services? What’s next for Spokane? Share your comments below, on Twitter, on Facebook, and around the web. We love to hear from you. Here’s the latest rendering of the Convention Center Hotel currently under construction in downtown Spokane. While the basic structure of the building has not changed much since its introduction, the materials to be used certainly have. When the project was announced, it was to be built of brick with hardly a street-level enhancement. Now, the hotel will feature white and black paneling not unlike that currently covering the Spokane Convention Center/INB Performing Arts Center itself, and the street level will feature a more lively lobby and retail/restaurant spaces. Also of note is the parking garage on the side of the block facing Main. Note the clean, bold lines of the black and white paneling and the addition of street-level enhancements. One of the fears that came with this project was that that side of the block would become dead space due to the parking garage. Now it appears that the ground level will be used for meeting or small convention space. What do you think? Has Walt Worthy and the Davenport Hotel Collection done enough to ensure that this latest entry into Spokane’s skyline aesthetically and actively fits with the rest of downtown? Are the paneling changes enough to ensure that the building doesn’t look like the Davenport Tower? And what about those Soviet-esque windows? Share your thoughts in the comments. General Growth Properties, the owner of NorthTown Mall at Wellesley and Division in north Spokane (and Spokane Valley Mall on Indiana), is planning a massive remodel of their largest inland Northwest property. The changes should get underway in the next few weeks as crews demolish much of the north side of the building to build a new, more central and clearly defined entrance. Significant modern and timeless architectural embellishments will be used to temper the current bare concrete facade of the building. The plan is to first demolish about 120,000 square feet of space between Macy’s and Kohl’s. Then 63,000 square feet of restaurant and retail space will be added in its place. The parking lot will be reconfigured and the interior of the building will be repainted and generally improved. Notably, GGP plans to sign tenants new to the Spokane area, but no announcements have yet been made. With construction getting underway shortly, all indications are that the renovations will be complete by early 2015. We’re pleased to see redevelopment at Spokane’s primary suburban-style mall, but we do wish that investment would be more concentrated downtown. The Downtown Spokane Partnership has already indicated that additional retail space, especially for large-format retailers similar to Nordstrom, is incredibly necessary downtown. With General Growth Properties making a major investment at NorthTown, downtown will have a hard time keeping up unless significant investment is made. And soon.